Xtra-Guard® 2 cable is a heavy-duty cable for use in industrial applications where abrasion and mechanical abuse is common. Xtra-Guard® 2 cable features a specially formulated, rugged polyurethane jacket offering three times the tear and abrasion resistance of ordinary PVC. It provides extreme resistance to cut-through and physical damage and is designed with moderate to high resistance to most oils, solvents, chemicals, and fuels. It offers outstanding ultraviolet light stability in all jacket colors and provides exceptional protection against EMI interference when Supra-Shield is specified. 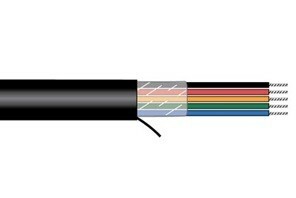 Xtra-Guard® 2 cable meets NFPA Standard 79 for industrial machinery. 1000 ft minimum, made to order.